Saudi Arabia’s attempts to promote ‘good’ muslim morals again. This time it’s a boycott of women’s lingerie sales men. Reem Assad began the boycott from her Facebook profile because protesting is illegal in Saudi. No doubt she’s one of the contestants for the Miss Morals Beauty Pageant too. It seems that the problem lies in a ban on female sales people, unless they work in all female shopping malls! Perhaps the Saudi Govt. will make an exception in the case of women’s lingerie or here’s another idea, why doesn’t Miss Assad use the all female shopping malls. The law in Saudi completely bans contact between men and women. 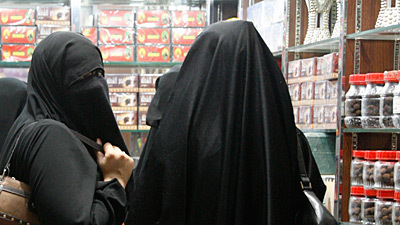 I now have this image of Saudi women wearing ill fitting bra’s and bloomers underneath their burqa’s. So what happens when women in Saudi need all the paraphernalia that goes along with being female…. I mean at least once a month they must need sanitary products! So that’s ok but buying your knickers and bra’s from a male shop assistant is unacceptable for a Saudi woman. What’s it all about ? The Middle East has some of the best news stories! Saudi Arabia have just launched a ‘ Beauty Pageant’ with a difference. The 200 girl strong contestant line up will be judged on their ‘respect and devotion’ to their parents rather than their looks. The agenda is more about promoting Islam and focuses on how a good muslim girl should behave…. obviously there are parental concerns about the demise of good muslim girls in Saudi these days. And apparently this the contest’s 2nd year… it’s a wonder it made it two years in a row. Somehow I can’t see the idea catching on any where else. I dont think the Ambassador to Dubai who recently had his marriage to a whiskery bride annulled will be such a keen supporter of the contest !